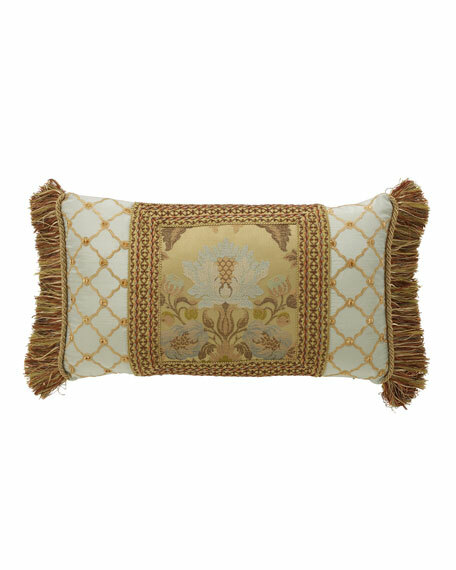 Dian Austin Couture HomePetit Trianon Pieced Pillow with Side Fringe, 15" x 26"
EXCLUSIVELY AT NEIMAN MARCUS Pieced pillow with medallion center and velvet sides. Jumbo tassels at top corners. Twisted cord finish around edges. Polyester/cotton/silk/rayon. Polyester fill. 17"Sq. Dry clean. Made in the USA of imported materials. EXCLUSIVELY AT NEIMAN MARCUS Oblong velvet pillow with gimp and cord trellis pattern. Front, rayon/silk. Back and fill, polyester. 13"
EXCLUSIVELY AT NEIMAN MARCUS Oblong velvet pillow with gimp and cord trellis pattern. Front, rayon/silk. Back and fill, polyester. 13" x 17". Dry clean. Made in the USA of imported materials.